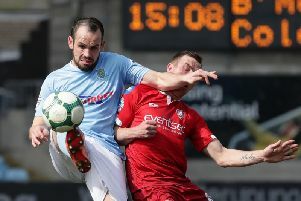 Ballymena United are not expected to play a home Danske Bank Irish League fixture until October. The pitch at the Warden Street Showgrounds has been relaid as part of a major investment at the venue. All the club’s scheduled Premiership matches for August and September at the Warden Street venue have been switched. The Sky Blues will be away to Crusaders on August 11, away to Ards on August 18 before travelling to Milltown to face Warrenpoint Town on September 1. There remains a questionmark around the game against Glentoran, scheduled for September 15, as the East Belfast club’s ground is unavailable. A date will have to be agreed between the clubs and the NIFL for that fixture. If the weather is favourable between now and mid-September the Braidmen may have their pitch available for a County Antrim Shield first round tie on September 18. However, realistically it is more likely that the game against Newry City on October 6 will now be their first of the new season on their home ground. With the early-season fixtures being reversed, United will now entertain Crusaders on October 27, Glentoran on November 10 and Ards on December 22, with Warrenpoint visiting the Showgrounds on Marc 23, 2019. The condition of the Showgrounds pitch has been problematic in recent years. “Barring unforeseen circumstances the date we have been given when the pitch should be available is September 15,” said United vice-chairman Don Stirling. The size of the pitch at the Warden Street venue is being extended as part of the work, meaning that United could play games in European competition at home in the future were they to qualify. “The fixtures will be released home and away as normal and my understanding is that we will then have to rely on the goodwill of other clubs to switch fixtures,” he added. The new surface at Ballymena Showgrounds was taking shape last week after the pitch was sown as part of a major investment in the venue. Work began in May to transform the pitch in order to revamp drainage and lay a new playing surface. Mayor of Mid and East Antrim, Councillor Lindsay Millar, said: “I am delighted the programme of extensive work on the pitch at Ballymena Showgrounds is progressing well. “Ballymena Showgrounds is a multi-use venue and Council continues to work closely with all users to ensure it remains one of Northern Ireland’s premier facilities. Given the restrictions on hosepipe use by NI Water, the surface is being watered using a borehole below the Showgrounds. Meanwhile the main Showgrounds pitch will be unavailable for the finals night of Super Cup NI on Friday July 27, so it is expected that those matches will be played on one of the other pitches, with temporary stands erected to accommodate supporters.